Light Duty Spring Hanger that we offer is widely used for light duty applications like small fans, humidifiers, variable air volume boxes, small fan coil units, small size piping, and air ducting in mechanical rooms. Light Duty Spring Hanger features a sturdy spring whose diameter to height ratios are designed to ensure that the spring will never buckle even when fully loaded. Furthermore, bulk quantities of our Light Duty Spring Hanger can be obtained at very nominal rates from us. 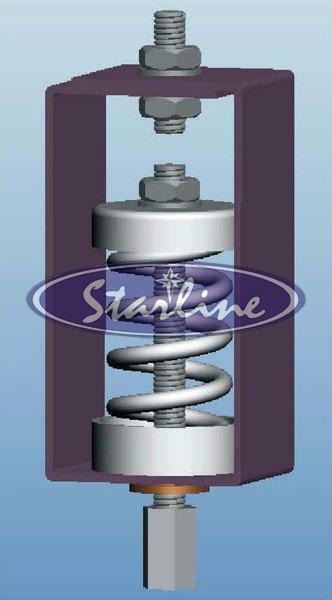 Spring diameter to height ratios are designed to ensure that spring will never buckle even when fully loaded. Suspension rod misalignment (30 degree arc) is compensated in hanger design. 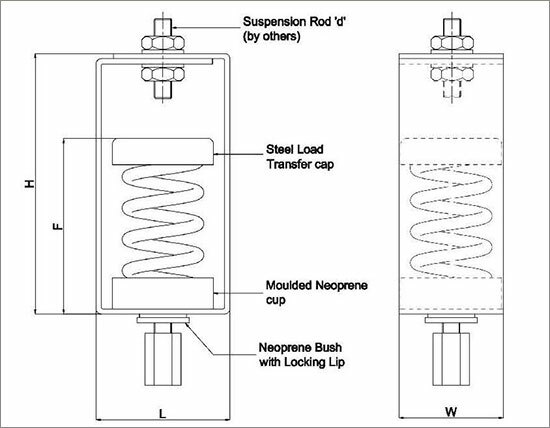 Locking rubber bush centralizes the spring and prevents dislocation. Springs are powder coated with appropriate color coding to faciliatate identification. Frame is made of G.I. Steel and powder coated to 100 microns paint thickness (exceeds 1000 hours of salt spray test) and conforming to ASTM B-117. Selection / Ordering : Point Load (Calculated to include all variables such as weight of water in pipe lines etc if applicable).